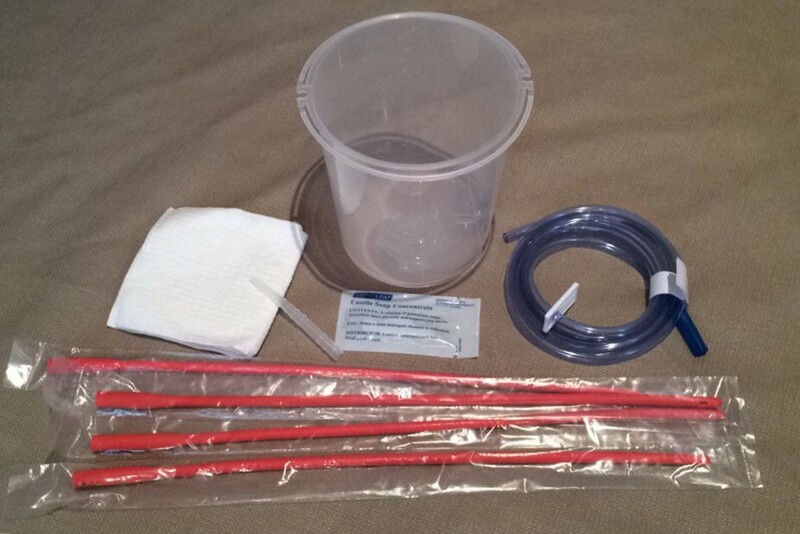 Enema Kit #2 includes: 1 (one) Enema Bucket Set, 1 (one) connector to connect tubing to catheter, tubing for catheter (1) and 4 (four) Catheters of your choice of Red Rubber or Silicone BPA free catheters for those with latex allergy. Sizes available in red rubber: 16 fr (5.3 mm or .21 inch diameter), 18 fr (6 mm or .24 inch diameter), 20 fr MOST COMMON (6.7 mm or .26 inch diameter), 22 fr USED FOR CASTOR OIL (7.3 mm or .29 inch diameter). Sizes available in silicone: 12 fr (4 mm or .16 inch diameter), 16 fr (5.3 mm or .21 inch diameter), 18 fr (6 mm or .24 inch diameter). Enema Kit #2 includes: 1 (one) Enema Bucket Set, 1 (one) connector to connect tubing to catheter, tubing for catheter (1) and 4 (four) Catheters of your choice. Red rubber catheter sizes: 16fr, 18fr, 20fr, and 22fr. Silicone BPA free catheters for those with latex allergy come in 12fr, 16fr and 18fr.